After a day in my thinking/moaning chair, I realized I was doing something 'interesting': I was laying out the shelf cleats with a ruler (tape measure or tick strip) and square, but I was judging the results using a spirt level. In other words, measuring one way, and judging another. 1. 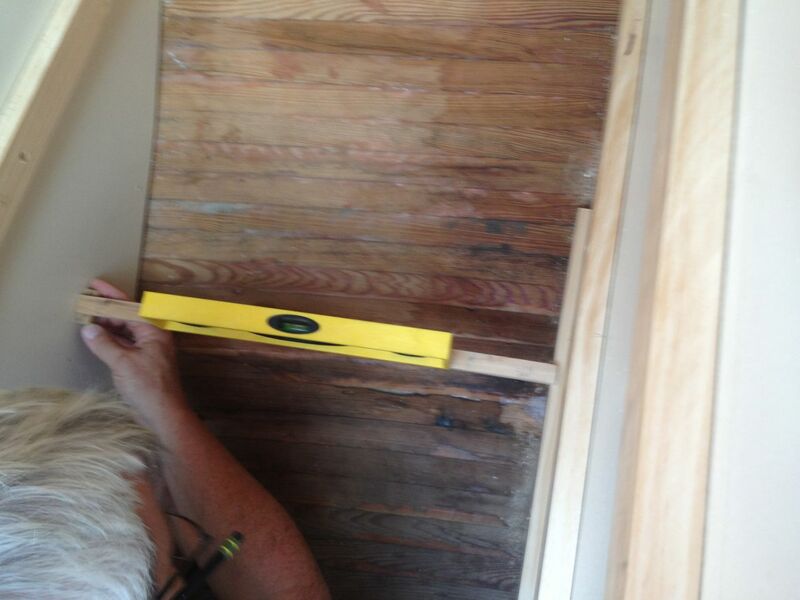 Using a tape measure (or tick strip) to measure the height of the front of each shelf, measuring down from the top rail of the bulkhead. 2. 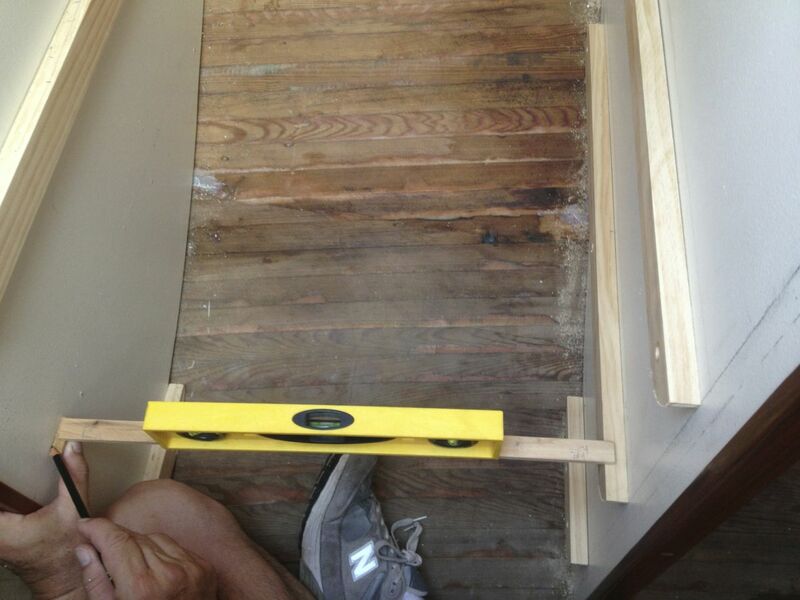 Using a carpenter's square, laid against the front rail and lined up with the shelf height tick, to draw the horizontal shelf. First, I'd made an error with the tape measure, and got the left side of the second shelf a bit too high. But the big problem was with the carpenter's square. I thought both front rails were lined up perfectly. The certainly looked aligned to the naked eye. So a perpendicular drawn on one bulkhead should be parallel to a perpendicular drawn on the other. But they weren't. The cleats on the left side tilted up as they went back. Clearly, the rail on the left side was leaning into the cabin ever so slightly. And ever so slightly is all you need with perpendiculars. I'd already figure this out, long ago, when drawing Cabin Boy's lofting grid. When you are drawing a long perpendicular, a tiny error in the angle gets amplified by the length of the square. For instance, if the left front rail was off just 1 degree, the end of the 36" square would be more than 1/2" higher than it should be. That was almost exactly the error I was getting. Helena's eyes were good enough to see the error, and the spirit level confirmed it. I'm sure there must be a 'correct' way to do this, but I decided to keep it simple. In a nutshell: to measure the same way I was going to judge the results. I again removed the cleats on the aft (left) bulkhead and with some trepidation, put my old plastic spirit level to work. I found a small block and held it at approximately the right hight on the left bulkhead. Then I laid a straight stick with the level on top between the block and the cleat on the right. Then I moved the block up and down until the bubble showed the stick was level. I then marked the location of the small block on the left side. Obviously, this could only be done early in the morning when the harbor was calm. But since the heat made it impossible to work at any other time, this was not a problem. Of course, I did the same thing at the back of the shelf, and then connected the two marks with a straight edge. After re-installing the cleats on the left side, the spirit level confirmed that the cleats were -- amazingly -- level in both the fore-and-aft and athwart-ship's directions, at least as long as I was standing directly front of the galley. If I moved forward, the shelves tilted ever so slightly to the right. If I moved aft, the shelves tilted to the left. But that's how boats work. Of course, in a busy anchorage, on a Saturday evening, with kids waterskiing in every direction, 'level' will be a joke. But come Sunday morning, as the sun comes up on a calm anchorage, it will be pleasant to melt butter on my little stove and watch it sizzle evenly on the bottom of the pan.